Five years earlier in 1774, Mozart had composed his Concertone in C major, K190. This has never had the enduring popularity of K364, but is paired with it on several recordings. I first got to know these two works on the EMI Oistrakh version of 1972, now in the 17CD Oistrakh Complete EMI Recordings box (50999 2 14712 2 3). Another satisfying coupling comes from Perlman and Zukerman on DG (415 486). The Concertone could, in a sense, be called a quadruple concerto; as well as two violins, the solo oboe and cello feature prominently. 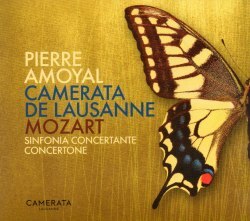 The Camerata de Lausanne is a conductorless string ensemble, founded by Pierre Amoyal. He plays solo violin in both works, and is joined by his wife Yuko Shiizu Amoyal on the viola for the K364, and by Ami Oike on the second violin for K190. I enjoyed this CD very much. The musicians deliver in captivating style with polished and focused playing. Amoyal and his fellow soloists approach the works as dialogues, with the instruments interweaving and blending with exquisite refinement. With buoyant tempi, Amoyal coaxes the players to deliver results that are rhythmic and well-articulated. All the while, there is the feeling of spontaneity. With excellent liner-notes, and a contribution from Amoyal himself, this is worth exploring. The Concertone definitely deserves wider circulation as it is deeply rewarding. The Salle de Musique provides a warm, sympathetic acoustic.